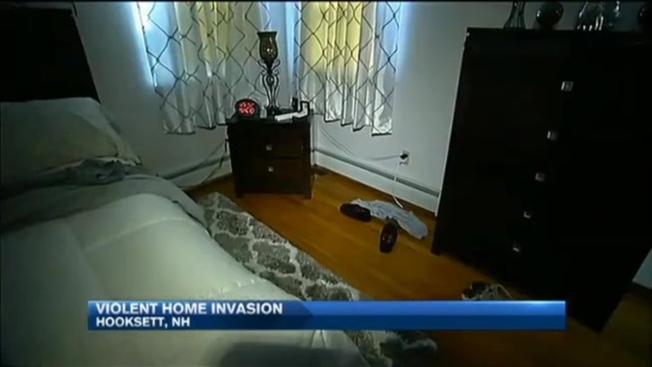 Two New Hampshire homeowners were robbed at gunpoint during a home invasion early Thursday morning. Police in Hooksett are looking for three suspects in the violent home invasion. The victim is telling her terrifying story, but necn is not showing her face or using her last name in order to protect her identity. "They had masks and gloves on," Christine recalled. She says she woke up around 2:30 a.m. Thursday to a nightmare. She heard her sliding door open and then came face-to-face with the three intruders. "She's was like, 'where's the money, where's the money, I know there's money around here,'" Christine said. She tells necn at least one of them had a weapon and wasn't afraid to use it. "That's when the kid put the gun to my temple," she said, pointing her finger at her head. With the barrel of the gun pressed against her temple, Christine says the suspects forced her to walk back to her bedroom where her husband was still sleeping. "I was just scared straight, I didn't want to panic," Christine said. She says for a half hour, she and her husband laid still on their bed - while the intruders searched for cell phones, jewelry and cash. Once the suspects left, Christine called 911. "Definitely, it went as good as it could have for this kind of situation," said Hooksett Police Sgt. Janet Bouchard. "It's horrible for the homeowners to experience, but they did everything right, and that's what we tell everybody to just do what they say, get them out of house as fast as possible and don't try to fight back and be a hero." Police say this home invasion could have easily turned into a shooting if it weren't for Christine's calm cooperation. "It was traumatizing, but I kept it together," Christine said. "Thank God, I thank God for it." Christine and her husband own a business in the area. Detectives say they do believe the suspects targeted their home for that reason. Police said a possible suspect vehicle is an older model, gray, 4-door sedan resembling a Honda or Toyota. The case remains under investigation, and anyone with information is asked to call 603-624-1560.